When Akemi Kakihara (who goes by AK) visited Fukushima in August, she performed a concert for the children at Fukushima Soma Minato Preschool. As a gesture of appreciation, the children, three- to five-year-olds who are unable to play outside due to the nuclear radiation issue, presented the New York-based pop singer with their own drawings. These drawings contained smiling faces, hearts, and flowers. Upon returning to New York, AK decided to use these drawings to help the children of Fukushima. AK and her Facebook group, JP Girls NYC, combined the drawings into holiday gift wrap, creating Fukushima “えがお Smile” Wrapping Paper, for sale in stores around New York. えがお (egao, pronounced “eh gaow”) means “smile” in Japanese, and JP Girls NYC hopes you will share these smiles with each present you wrap. The paper is available in two sizes: 11” x 17” for $1 a sheet and 24” x 36” for $5 a sheet. 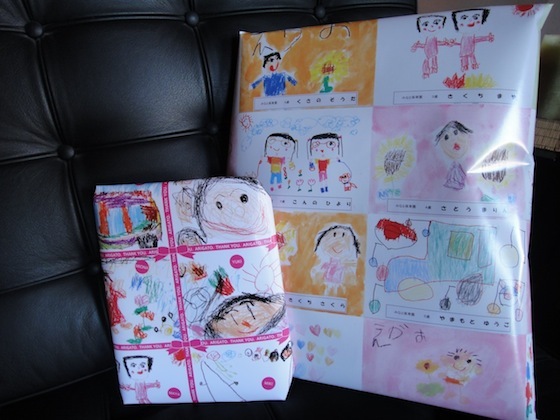 All of the profits from the sales of Fukushima “えがお Smile” Wrapping Paper benefit Japan Quake Fukushima Children Relief to provide support to children who lost their parents in the earthquake and tsunami that devastated northeastern Japan on March 11. When you give gifts this holiday season, make sure they’re wrapped in Fukushima “えがお Smile” Wrapping Paper. Brighten the lives of children in northeastern Japan. For more information, “like” JP Girls NYC’s Facebook page.